On Monday, Panjab police used brute force and scare tactics to shut down Bapu Surat Singh’s peaceful protest within his own home in Hassanpur. Many supporters and organisers of the campaign have been arrested. Thirteen Singh’s including Sukhjit Singh Khosa and Bagicha Singh Rattakhera were produced in Court and charged under Sections 186 and 353 of the Indian Penal Code – for obstructing or assaulting a public servant from discharge of his duty. They have been sent to judicial custody in Ludhiana Central Jail until 4th August 2015. Meanwhile in Ludhiana, members of the Sangharsh Committee who had been detained by the Panjab police were brought from jail to a meeting with police and state officals, to negotiate on Bapu Surat Singh’s hunger strike. The State offered to give in writing, that it would take a period of 2-3 months to finalise the release of any eligible political prisoners and requested that Bapu Ji drink some water and allow doctors to carry out a medical check up immediately. However, negotiations broke down when it was decided that Bapu Ji was firm in his commitment and until the states’ actions yeild actual results, no compromises can be made. So, the deadlock continues on the Sikh political prisoners issue and as of yesterday, Gurdeep Singh Bathinda, Jasvir Singh Khadoor Sahib, Mokham Singh and Manjinder Singh Jandi, members of the Sangharsh Committee, were again sent back to jail and new charges registered against them. SOPW have been at the forefront for the struggle to release political prisoners for a considerable number of years. 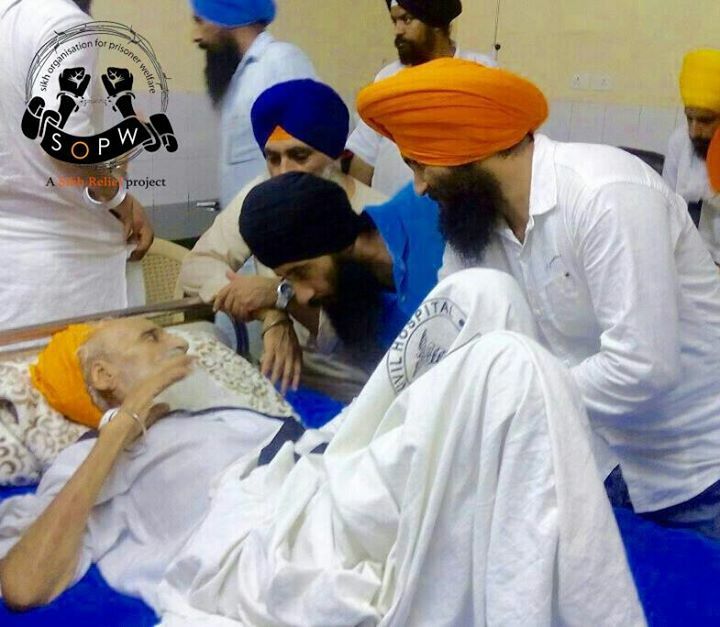 Bapu Ji has always held our work in high regard and yesterday, our team of RP Singh, Parminder Singh and Gurpreet Singh, were again at Bapu Ji’s bedside to offer all assistance and support, as the authorities take a more negative turn in their response to the campaign.